A new Hoyer test centre in Denmark will offer shorter lead times and faster classification of electric motors. The new test centre will work closely with Hoyer’s Chinese test centre to ensure quick and efficient servicing of the entire international value chain. In order to add more flexibility and faster documentation in its collaboration with customers, Hoyer Motors has invested a large sum in a new test centre at the head office in Denmark. Once the test centre is fully operational in December 2018, Hoyer will also be able, at short notice, to test and certify electric motors of up to 1000 kW in Europe. The test centre is the natural extension of Hoyer Motors’ strategic focus on its OEM customers within the market segments: Marine, Water, HVAC, HPU, Oil & Gas and Wind. In recent years Hoyer has initiated several initiatives to position themselves towards this very target group. 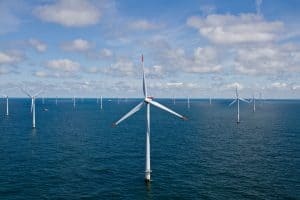 “Hoyer’s electric motors are used in critical applications on board ships, in wind turbines and on oil rigs, so it is crucial that the manufactures and their customers trust the quality of the motors to be able to handle the specified requirements. It is absolutely essential to signal we are a serious business partner and build up trust,” says Hoyer’s CEO Henrik Sørensen. The test centre will also provide Hoyer with the opportunity to invite customers to observe the various tests being conducted. The same applies to the collaborative partners from the maritime classification societies such as ABS, DNV GL and BV, where Hoyer already works closely with their surveyors. The new test centre is built upon the same principles as Hoyer’s existing test centre in Ningbo, China, and the two centres will be working closely together to ensure quick and efficient servicing of Hoyer’s international value chain. “We are a global company and our customers operate across the entire world. We therefore consider it natural for us to be able to conduct testing in both Asia and Europe. We can transfer many experiences from China to Denmark, and the two sites will operate concurrently as a combined unit with shared resources and competences. This makes us less vulnerable during peak periods and affords better opportunities for skills development,” says Henrik Sørensen. In the first instance the new test centre will be able to conduct no-load tests on motors up to 1,000 kW, with a voltage up to 830 volts and at frequencies from 10 to 120 Hz. 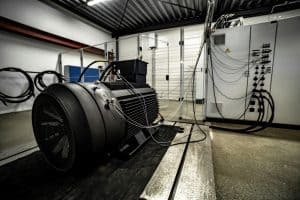 Over the course of 2019 the capacity will be extended to allow for full-load motor testing and tests of medium voltage motors with voltages up to 13,200 volts. Over the course of 2019, the test centre will be expanded to include no-load tests up to 13,200 volt, motor tests with load (full-load) up to 315 kW, temperature tests and curve measurement of speed torque and performance. The new test centre will supplement Hoyer’s existing test centre in Ningbo, China. The test facility is a central part of Hoyer’s strategy of strengthening the collaboration with the market-leading OEM´s of applications such as pumps, ventilation systems and HPUs within selected market segments.